All services will start at 7pm and should last no longer than 30 minutes. This year we are following the events as told in St John's gospel starting at chapter 12. Each service is stand alone but we encourage you to come to as many of the services as possible as we journey round the parishes, hearing afresh the Easter story. On Easter morning, 21st April, there will be a service at 8am in Glenholm Kirkyard followed by breakfast in Glenholm Cottage. There will also be an egg hunt after the service so please encourage your friends, neighbours and visitors to join us in celebrating Christ risen. All churches will have Easter services at the normal times that day. The weekly listening hour at the Laurel Bank tearoom has resumed at 10:30am on Mondays with our new locum John Smith. However, there will be no listening hour tomorrow due to John having a prior engagement. They will resume on Monday 22nd April. We are delighted to announce that Rev John Smith has agreed to be our new locum. John takes up his duties as from tomorrow and can be contacted by phone at 07710 530 193 or email at midmarjohn@gmail.com. Holy week is nearly upon us and, as usual we will be holding services in each of the churches throughout the week with our 'pilgrimage round the parishes', starting in Tweedsmuir church on Monday 15th April at 7pm. This year we will be following the story as told in John's gospel and we invite everyone to come to as many of the services as possible. The weekly listening hour at the Laurel Bank tearoom will resume tomorrow at 10:30am with our new locum. Please note that the weekly sessions will now be on Monday until further notice. Please come along and say hello to John. Easter Sunday 21st April - Love Wins - 8 am Glenholm Churchyard outdoor service with hidden eggs to hunt followed by breakfast in Glenholm cottage. Easter services at usual times in all 4 churches. The Worship Workshop meets tonight , 31st March in Glenholm Cottage at 7pm. Everyone is welcome to come along and join the discussion and plans for worship in the Parishes of Upper Tweeddale in the forthcoming months. The sacrament of Holy Communion will be celebrated in Broughton and Skirling churches next Sunday,7th April at the normal church times. 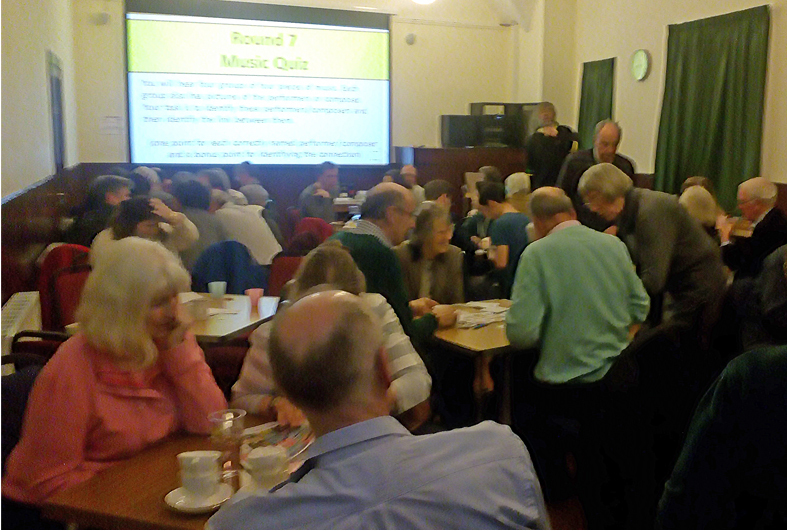 Thank you to all who supported the Guild Quiz night on Friday. It was very well attended and we managed to raise £437 which after expenses, will be sent to Guild Headquarters for Seema's project. This is helping to build a home for abandoned children in Pune, India. This year the Lent Studies are on a series of films called The God Question. In six half hour episodes, world renowned contributors from both sides of the science/God debate unpack the evidence found in the Cosmos, Life and Evolution and the hidden depths of Mind and Consciousness. The films are very watchable and lead to some lively discussion. The third and final session will be on Thursday 28th March in Broughton Village Hall starting at 7:00pm. The sacrament of Holy Communion will be celebrated in Broughton and Skirling churches on Sunday,7th April at the normal church times. Please note that the Annual Stated Meeting for Skirling Church will be held after the service on Sunday 24th March. This year the Lent Studies are on a series of films called The God Question. In six half hour episodes, world renowned contributors from both sides of the science/God debate unpack the evidence found in the Cosmos, Life and Evolution and the hidden depths of Mind and Consciousness. The films are very watchable and lead to some lively discussion. The next session will be on Thursday 21st March in Broughton Village Hall starting at 7:00pm. 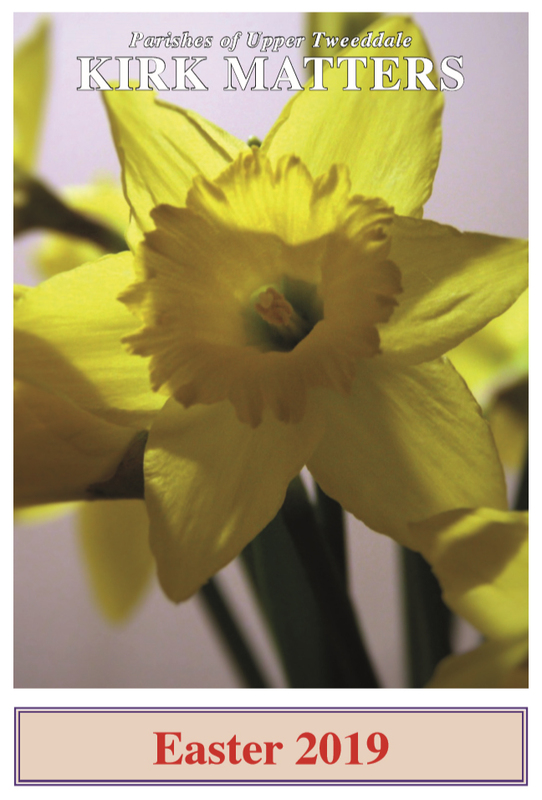 The Guild AGM will take place on Wednesday 20th March at 2:30 in Broughton Village Hall, followed by Afternoon Tea. You are invited to come along and hear what we've been up to in the past year. The Guild are organising a Quiz Night on Friday 22nd March in Broughton Village Hall starting at 7pm. This year the Guild Project we are supporting is raising money to help build a home for abandoned street children in Pune, India. The charge is £20 per table of 4 and includes a sandwich supper at half time. An extra 10 points will go to each table which has one or more person under 16. Tables can be booked by contacting Fiona on 830408 or fiona@glenholm.co.uk. Come and join the fun! If you can't make up a team, come along on the night and we'll make a team for you. Please note that the Annual Stated Meeting for Broughton Church will be held after this service, and for Skirling Church on Sunday 24th March. This year the Lent Studies are going to be based on a series of films called The God Question. In six half hour episodes, world renowned contributors from both sides of the science/God debate unpack the evidence found in the Cosmos, Life and Evolution and the hidden depths of Mind and Consciousness. The films are very watchable and should lead to some lively discussion. The first session will be on Thursday 14th March in Broughton Village Hall starting at 7:00pm. Please note that the Annual Stated Meeting for Tweedsmuir Church will be held after this service, for Broughton church on Sunday 10th March and Skirling church on Sunday 17th March. Thank you to all who came and supported the World Day of Prayer service on Friday. The sum of £105.90 will be sent to the organisers for the work in Slovenia. The Worship Workshop will be meeting this evening (3rd March) in Skirling House at 7:30pm. Everyone is welcome to come along and join in the discussion and plans for worship in the Parishes of Upper Tweeddale in the forthcoming months. Tomorrow evening, Monday 4th March, the Joint Kirk Session is inviting everyone in our congregations to an 'Invitation Sunday' presentation. More details as promised in the 'Window on the World' article and pancakes will feature in the evening. We've also invited our neighbours from Carlops, Newlands and West Linton churches to join us. Come along to what is sure to be an interesting and enjoyable evening starting at 7:30pm in Broughton Village Hall. The Guild are organising a Quiz Night on Friday 22nd March in Broughton Village Hall starting at 7pm. This year the Guild Project we are supporting is raising money to help build a home for abandoned street children in Pune, India. The charge is £20 per table of 4 and includes a sandwich supper at half time. An extra 10 points will go to each table which has one or more person under 16. Tables can be booked by contacting Fiona on 830408 or fiona@glenholm.co.uk. Come and join the fun! 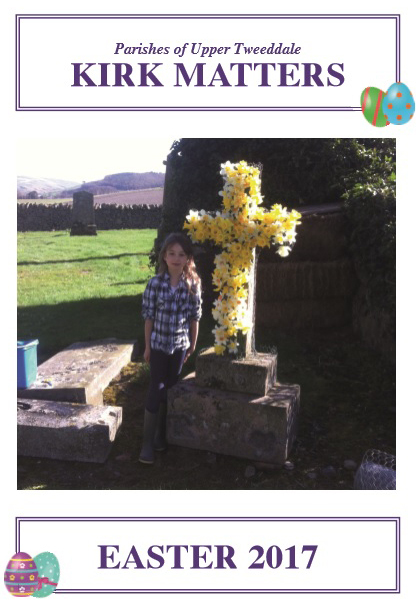 The Treasurer's report for Broughton Church is available for collection from the Church today. Please remember to bring it with you for the ABM next week. This year's World Day of Prayer service in Upper Tweeddale will be held on Friday 1st March starting at 2pm. This year the service has been put together by the women of Slovenia and after the service refreshments with a Slovenian theme will be served. Please come and join us for this service. The sacrament of Holy Communion will be celebrated in Tweedsmuir and Stobo churches next Sunday,3rd March at the normal church times. Please note that the Annual Stated Meeting for Tweedsmuir Church will be held on Sunday 3rd March and for Broughton church on Sunday 10th March, both after the normal services. Dates for Stobo and Skirling will be intimated as soon as I'm informed. A date for your diary, on Monday 4th March the Joint Kirk Session is inviting everyone in our congregations to an 'Invitation Sunday' presentation. More details as promised in the 'Window on the World' article and pancakes will feature in the evening. We've also invited our neighbours from Carlops, Newlands and West Linton churches to join us. Come along to what is sure to be an interesting and enjoyable evening starting at 7:30pm in Broughton Village Hall. The Guild meets on Wednesday 20th February in Broughton Village Hall starting at 2:30pm. This month, Rev Pamela Strachan will be talking about her recent study tour to Lebanon. We've invited Newlands Guild to join with us for the afternoon and we encourage anyone interested in hearing more about Lebanon to come along. The Worship Workshop will be meeting this evening (27th January) in Glenholm Cottage at 7:30pm. Everyone is welcome to come along and join in the discussion and plans for worship in the Parishes of Upper Tweeddale in the forthcoming months. • I was able to get some annuals from WH Smith so I gave my brother a book for his Christmas. Young person aged 10. From everyone here we thank you and wish you all the best for 2019. Please note that the General Kirk Session has decided to cancel Haggis Sunday this year. 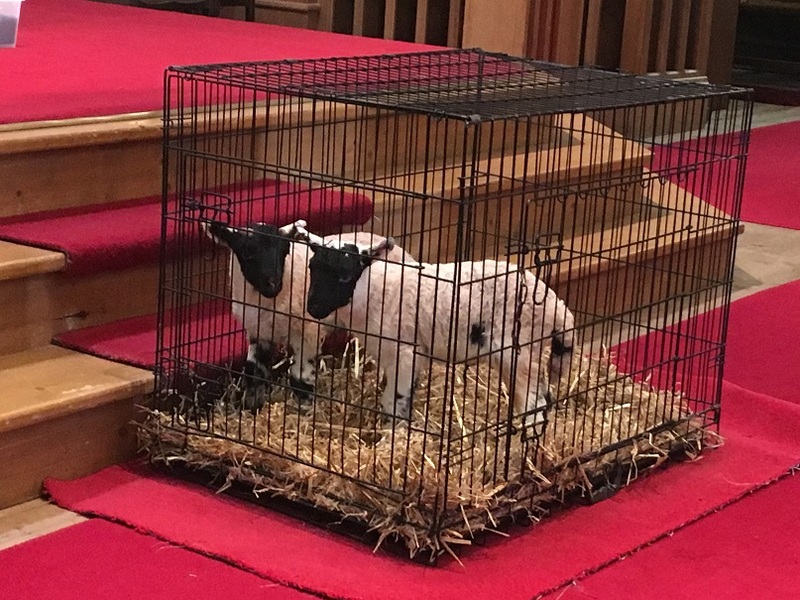 It was felt that with us relying more on pulpit supply and the worship workshop to lead worship at this time, it was perhaps one event too many at the moment. We hope to resurrect it next year and apologies to all those who were looking forward to their haggis lunch. The next meeting of the Guild will be held this Wednesday, 16th January at 2:30pm in Broughton Village Hall. The speaker this month will be Dr Tony Foley who will be talking about his life in Taiwan and we welcome new and old members to the first meeting of the new year. CrossReach have sent us a thank you for the money we sent recently. Rebecca Tennant, the Community and Events Officer writes " Thank you so much for joining in and making a positive impact with us. Here at CrossReach, we deliver services in Jesus's name. Our services, covering the areas of Adult Care Services, Services to Older People and Children and Family Services are a vital support to many vulnerable people across Scotland. Your donation enables us to make immediate positive impacts on the lives of those we are working with." Elders please note that the General Kirk Session will meet in Broughton Church tomorrow (Monday 7th January) at 7:30pm. As usual, anyone is welcome to attend. The sacrament of Holy Communion will be celebrated in Tweedsmuir and Stobo churches next Sunday, 13th January at the normal church times. The next meeting of the Guild will be held on Wednesday 16th Junuary at 2:30pm in Broughton Village Hall. The speaker this month will be Dr Yvonne Foley and we welcome new and old members to the first meeting of the new year. As usual, the people of Upper Tweeddale have excelled themselves in their Christmas donations at the various events in the past few weeks. We managed to raise £1325.18 which will be split between CrossReach and the Cyrenians. Thank you to all who contributed. Elders please note that the General Kirk Session will meet in Broughton Church on Monday 7th January at 7:30pm. Minutes have been sent via email and email buddies should be delivering those to non email users. It's nearly Christmas so lots of things going on in the parishes. On Thursday 20th December, you are invited to an evening of carol singing, mince pies, mulled wine and more in Skirling Village Hall from 6:30-8:30pm. A fun evening, not to be missed. Please note there will not be an advent discussion this week. On Friday 21st December, join the school at their end of term service in Broughton Church starting at 9:30am. Come and support our local school community as they break up for the holidays. On Sunday 23rd December, a traditional candlelit service of carols and readings will take place in Drumelzier church starting at 6:30pm to which you are all invited. Just the ticket to get you in the festive mood. Please remember to bring a torch to light your way there and back to your car. On Monday 24th December, join us in Tweedsmuir Church for a Christmas eve service starting at 6:30pm. Come and hear the christmas story, sing carols and join in the excitement and anticipation of Christmas morning. Again, please remember to bring a torch. On Christmas day there will be a family service in Stobo Church starting at 11am and led by Rev Nancy Norman. Please bring your toys to show Nancy. There will be carols aplenty to sing as we celebrate the happy morn, the birth of the Christ child. This year all the collections from the Christmas services will be split between CrossReach, which is the Church of Scotland's social care council and Cyrenians, a Scottish charity helping the homeless and vulnerable in Edinburgh and South East Scotland. It is with great sadness that we have to announce the death of Mrs Margaret Ellis on Wednesday 5th December. Margaret was an elder at Tweedsmuir for many years. A private service and interment in Tweedsmuir cemetery will be held on Friday 14th December followed by a service of thanksgiving in Broughton church at 11:30 to which all are invited. 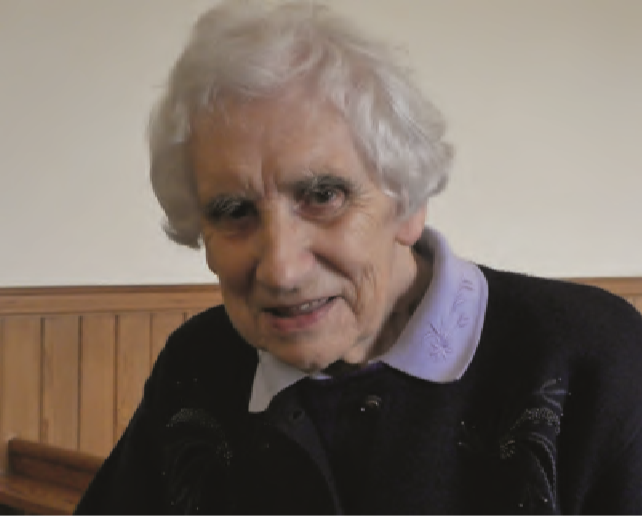 Mary Midgley's family is sad to announce that she died peacefully on 23 November 2018. A service of thanksgiving is being held at Ettington Parish Church, Warwickshire on Wednesday 12 December 2018. Mary was the last surviving child of Professor Thomas and Martha Elliott who built Broughton Place. Thank you to all who supported the Christmas Craft Fair on Friday 7th December and in particular supported the Guild raffle. We managed to raise £245 for Guild funds. It is with great sadness that we have to announce the death of Mrs Margaret Ellis on Wednesday 5th December. Margaret was an elder at Tweedsmuir for many years. A private service and interment in Tweedsmuir cemetery will be held on Friday 14th December followed by a service of thanksgiving in Broughton church at 11:30 to which all are invited. 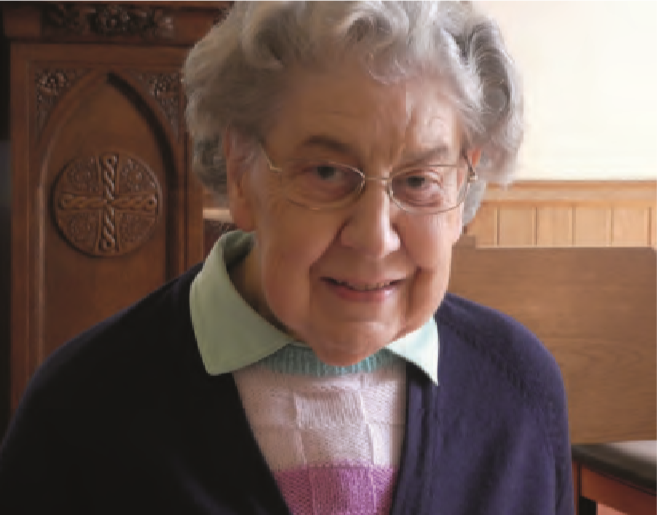 Due to family issues, Rev Ann Purdie has had to step down from the locumship in Upper Tweeeddale in the meantime. Please keep Ann and her family in your prayers during this difficult period. Whilst we have no locum, anyone requiring the services of a minster should contact our Interim Moderator, Rev Calum Macdougall on 01721 720568. The advent discussion group will meet again on Thursday13th December at 7:30 in Skirling Village Hall. Copies of the book are available in each of the churches or by phoning John Burnett on 830303. This week we'll be looking at days1-4 of week 2, a time for patience and welcome everyone interested to join us as we prepare for the Christmas season. Christmas Craft Fair Thank you to all who supported the evening and in particular supported the Guild raffle. We managed to raise £245 for Guild funds. Gift Services are being held today in each of our churches. This year we are again supporting two charities. Warm clothing and toys will go to Edinburgh The Old Kirk and Muirhouse to be distributed in the West Pilton area of Edinburgh. Gift vouchers are particularly appreciated for young people supported by the Borders Young Carers Trust which enable the young carers to choose their own gift. The Worship Workshop willl be meeting this evening (2nd December) in Skirling House at 7pm. Everyone is welcome to come along and join in the discussion and plans for worship in the Parishes of Upper Tweeddale in the forthcoming months. The advent discussion group will meet again on Thursday 6th November at 7:30 in Skirling Village Hall. Copies of the book are available in each of the churches or by phoning John Burnett on 830303. This week we'll be looking at days 4-7 of week 1, a time for thanksgiving and welcome everyone interested to join us as we prepare for the Christmas season. Skirling Lunch Club Christmas Lunch – Thursday 6th December 12.30pm, Skirling Village Hall The Fifth Annual Christmas Lunch, home-cooked turkey with all the trimmings followed by Christmas Pudding or Trifle. Just £3.50 for adults, £2.00 for children under 11 years or donation. Good food, good fun, good value, let Sheila know if you plan to come along kirkbrae@btinternet.com or 01899 860 287. Christmas Craft Fair – Friday 7th December 6.30 to 8.30pm Broughton Village Hall. The evening starts at 6pm with switching on of the Christmas Lights at the school, followed by the garage and then the village hall. Come along and browse the craft stalls, have a go at the tombola, enjoy a hot drink and visit Santa’s Grotto, The Guild will also be there with a hamper raffle. Entrance by donation. Gift Services will be held in each of our churches next Sunday, December 9th. A chance to gift something to those who have little at Christmas. Gifts for all ages welcome, unwrapped please, Separate wrapping paper is a bonus. This year we are again supporting two charities. Warm clothing and toys will go to Edinburgh The Old Kirk and Muirhouse to be distributed in the ----West Pilton area of Edinburgh. Gift vouchers are particularly appreciated for young people supported by the Borders Young Carers Trust which enable the young carers to choose their own gift. The advent discussion group will be having its first meeting on Thursday 29th November at 7:30 in Skirliing Village Hall. This year we will be looking at Tom Wright's book Advent for Everyone, A journey with the Apostles. Copies of the book are available in each of the churches or by phoning John Burnett on 830303. We'll be discussing week 1 a time for thanksgiving and welcome everyone interested to join us as we prepare for the Christmas season. The Biggar Singers Christmas Concert is on Saturday 1st December in St Mary's hall, North Back Road at 7.30pm. Tickets £10 at the door, which includes wine and nibbles after the concert. Christmas Craft Fair – Friday 7th December 6.30 to 8.30pm Broughton Village Hall. The evening starts at 6pm with switching on of the Christmas Lights at the school, followed by the garage and then the village hall. Come along and browse the craft stalls, have a go at the tombola, enjoy a hot drink and visit Santa’s Grotto, entrance by donation. Skirling Lunch Club Christmas Lunch – Thursday 6th December 12.30pm, Skirling Village Hall The Fifth Annual Christmas Lunch, home-cooked Turkey with all the trimmings followed by Christmas Pudding or Trifle. Just £3.50 for adults, £2.00 for children under 11 years or donation.. Good food, good fun, good value, let Sheila know if you plan to come along kirkbrae@btinternet.com or 01899 860 287. Gift Services will be held in each of our churches on Sunday December 9th. A chance to gift something to those who have little at Christmas. Gifts for all ages welcome, unwrapped please, Separate wrapping paper is a bonus. This year we are again supporting two charities. Warm clothing and toys will go to Edinburgh The Old Kirk and Muirhouse to be distributed in the ----West Pilton area of Edinburgh. Gift vouchers are particularly appreciated for young people supported by the Borders Young Carers Trust which enable the young carers to choose their own gift. Please note that Holy Communion will be celebrated in Broughton and Skirling churches next Sunday (2nd December) at the usual service times. This afternoon (18th November) you are invited to a congregational lunch followed by a talk by Sir Hew Strachan on the 1st World War in Drumelzier Village Hall. Lunch will be served at 1pm and at 3:30pm we will move to Drumelzier church for a Service of Remembrance. The Guild meets on Wednesday 21st November at 2:30 in Broughton Village Hall. This month our speaker will be Rev Ann Purdie and you will be made very welcome in joining us for the afternoon. Members please remember to bring along items for the Christmas Craft fair hamper. The advent discussion group will be having its first meeting on Thursday 28th November at 7:30 in Skirliing Village Hall. This year we will be looking at Tom Wright's book Advent for Everyone, A journey with the Apostles. Copies of the book are available in each of the churches or by phoning John Burnett on 830303. We'll be discussing week 1 a time for thanksgiving and welcome everyone interested to join us as we prepare for the Christmas season. Advance notice of Biggar Singers Christmas Concert on Saturday 1st December in St Mary's Hall, North Back Road at 7.30pm. Tickets £10 at the door, which includes wine and nibbles after the concert. Rev Ann Purdie has been appointed our new locum as of 19th November and we are very grateful to her for agreeing to do this. 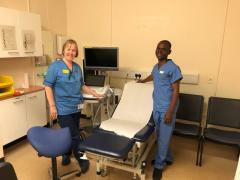 Ann we hope you find your time as our locum both a joy and a blessing. This afternoon, 11th November there is to be a short Act of Reconciliation and Thanksgiving for Peace at the site of First World War German Prisoner of War Camp on the Dawyck Estate. Please meet at Stobo Village Hall at 2:30pm from where we will walk to the site. Stout footwear should be worn. The ceremony at the site will last about 15 minutes and then all attending are invited to return to Stobo Village Hall where refreshments will be served. Next Sunday (18th Nov) you are invited to a congregational lunch followed by a talk by Sir Hew Strachan on the 1st World War n Drumelzier Village Hall. Lunch will be served at1pm and at 3:30pm we will move to Drumelzier church for a Service of Remembrance. Please invite your friends and neighbours to come along and please let your Session Clerk know who is coming for the catering. The next issue of Kirk Matters is planned to be ready for distribution by the beginning of December. The deadline for articles is Monday 19th November and should be sent to Fiona (fiona@glenholm.co.uk, tel 830408) as Isobel is on holiday. Advance notice of Biggar Singers Christmas Concert is on Saturday 1st December in St Mary's Hall, North Back Road at 7.30pm. Tickets £10 at the door, which includes wine and nibbles after the concert. And finally...Please keep Tony in your prayers this week. He is defending his PhD thesis on Thursday. Elders please note that the GKS will meet tomorrow (Monday 5th November) in Skirling Village Hall at 7:30pm. Next Sunday is Remembrance Sunday Services and Acts of Remembrance will take place in all four churches at the usual times. In addition, the UK Government is inviting all congregations to join the nation in marking the end of the First World War by ringing church bells at 12.30pm on Sunday 11 November to coincide with the nation’s tribute as thousands march past the Cenotaph in London. On Sunday afternoon, 11th November there is to be a short Act of Reconciliation and Thanksgiving for Peace at the site of First World War German Prisoner of War Camp on the Dawyck Estate. meet at Stobo Village Hall from where we will walk to the site. Stout footwear should be worn. The ceremony at the site will last about 15 minutes and then all attending are invited to return to Stobo Village Hall where refreshments will be served. You are invited to a congregational lunch followed by a talk by Sir Hew Strachan on the 1st World War on Sunday 18th November in Drumelzier Village Hall. Lunch will be served at1pm and at 3:30pm we will move to Drumelzier church for a Service of Remembrance. Please invite your friends and neighbours to come along and please let your Session Clerk know who is coming for the catering. The next issue of Kirk Matters is planned to be ready for distribution by the beginning of December. The deadline for articles is Monday 19th November and should be sent to Fiona ( fiona@glenholm.co.uk, tel 830408) as Isobel is on holiday. Betty and Jessie Eastland would like to convey their many sincere thanks for the cheque which they received last Sunday and which was a big surprise. They say "We hope you enjoyed the service with so many from the Upper Tweeddale congregations coming together making for great singing - wonderful!" The Worship Workshop meets tonight in Glenholm Cottage at 7:30pm. Everyone is welcome to come along and join in the discussion and plans for worship in the Parishes of Upper Tweeddale in the forthcoming months. Elders please note that the next meeting of the GKS will be held in Skirling Village Hall on Monday 5th November starting at 7:30pm. The next issue of Kirk Matters is planned to be ready for distribution by the beginning of December. The deadline for articles is Monday 19th November and should be sent to Fiona ( fiona@glenholm.co.uk, tel 830408) as Isobel is on holiday next month. Thank you to all who supported the harvest supper last week. From the reports received, a good night was had by all and £326 has been sent to the RSABI. You are invited to a talk entitled From Scotland to Jerusalem followed by Supper in Drumelzier Village Hall on Friday 19th October at 6:30pm. Tickets (adults £10, under 13's £8) can be obtained from either the Birchalls (830319) or Campbells (01721 760252). On Sunday 21st October, there will be a joint service in Skirling Church at 11am followed by a lunch in Skirling Village hall. This is to celebrate the retirement of Betty and Jessie Eastland from active eldership in Skirling church after 42 years of service. All are welcome to come and celebrate with us. Please note, there will be no services in the other churches. You are invited to an afternoon conference on the Middle East. followed by a service of prayer for peace and Justice in Israel and Palestine. This has been organised by the Presbytery at the request of the General Assembly to learn more about the church's involvement in the Middle East. The date is Wednesday the 24th October, the venue is Innerleithen church and the programme starts at 2:30pm. You are invited to an afternoon conference on the Middle East. followed by a service of prayer for peace and Justice in Israel and Palestine. This has been organised by the Presbytery at the request of the General Assembly to learn more about the church's involvement in the Middle East. The speakers will be Rev Grant Barclay who spent many months in Israel making a film about the Balfour declaration, Rev Ian Cunningham, former Convener of World Mission Council and Val Brown from Christian Aid. The date is Wednesday the 24th October, the venue is Innerleithen church and the programme starts at 2:30pm. 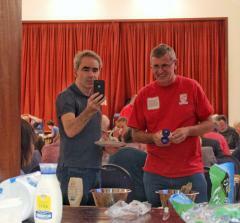 The Harvest Supper held on 29th September was a huge success. Musical entertainment was provided by John (accordion) and Rebecca (violin) from Biggar, playing together for the first time, and by Strumash, the excellent ukulele band from Peebles. With quizes (relevent to the occasion) and a hearty supper provided by Bob and Isobel Hunter and Fiona Burnett there was food for mind and body, and the event raised £326 for the Royal Scottish Agricultural Benevolent Institute. Many thanks go to the wonderful musicians who gave their time to keep us all entertained, to Bob, Isobel and Fiona who spent hours in the kitchen preparing the food, to Tony Foley for compèring (and doing the washing up), to all who came along and made the evening a success, and especially to those who generously contributed the apples and plums from their gardens which were turned into apple and plum crumbles. The first meeting of the Guild for this session will be this Wednesday, 19th September in Broughton Village Hall starting at 2:30pm. Our speaker will be Rev Tony Foley who will be introducing the new 3 year Guild Strategy 'One Journey, many Roads' All are welcome to join us, new members and visitors are especially invited. Just a reminder that next Sunday (23rd September), Harvest Thanksgiving will be celebrated in Broughton and Skirling churches at the usual times and in Tweedsmuir and Stobo the following Sunday. Donations of dried and tinned goods and toiletries welcomed. These will be taken to the Muirhouse Community Shop on Pennywell Road in Edinburgh. This shop serves the local communities of Muirhouse and West Pilton with whom the Parishes of Upper Tweeddale have long had a connection. The annual Harvest Supper will take place in Broughton Village Hall on Saturday 29th September at 6pm. Food, fun and music are on the menu so please encourage your friends and neighbours to join us to celebrate harvest home in our community. 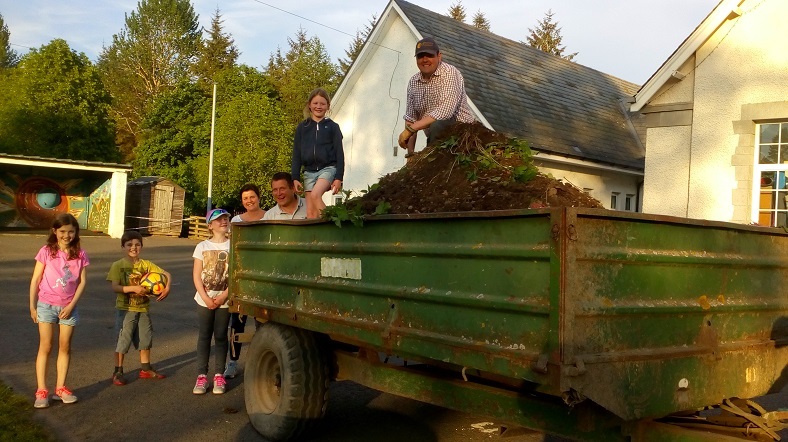 All proceeds will be going this year to the Royal Scottish Agricultural Benevolent Institution. On Saturday 8th September a concert was held in memory of the life of Lord Stewartby in Broughton Village Hall. The concert was incredibly well attended and raised an amazing £2,150 for Parkinson's Charity. Many thanks to all who came along and contributed so generously. As of the end of September Betty and Jessie Eastland are retiring as active elders in Skirling Kirk. They have however assured us that they still intend to be involved in the life of the Kirk and are keen to stay in touch with what is going on in the Parishes. The congregation in Skirling would expect and accept nothing less. Here are some of their recollections of their long involvement with Skirling and its church. The sisters were both born in the village and attended Sunday school along with all the rest of the children, even those whose parents were not in church. Then when they were older it was Bible Class in the Church or in the Manse. Bible Class involved homework on that week’s text in a pink exercise book marked up each week by the Minister. Then they joined the church in their mid-teens again along with majority of the local children; they remember twelve teenagers joining one Sunday. 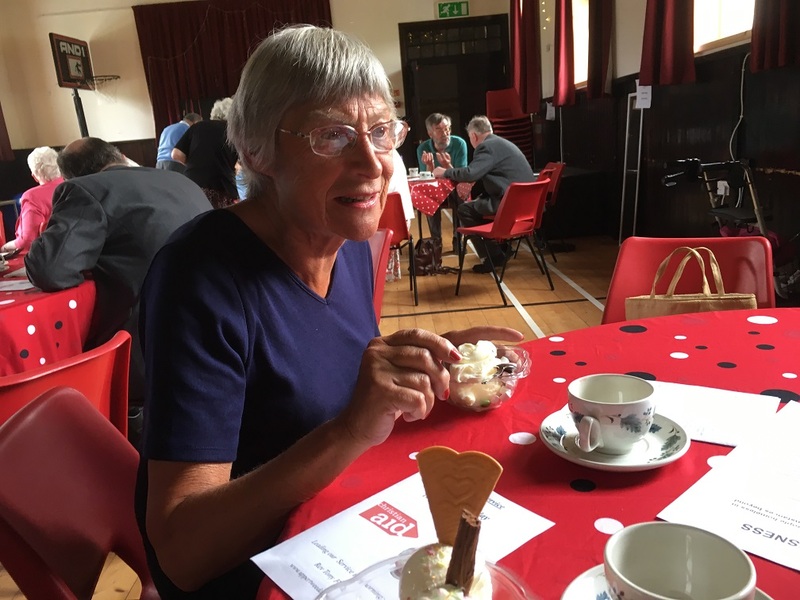 Betty has seen ten ministers come and go in Skirling, initially Skirling Ministers, then linked with Broughton then in the 1970’s, as we are today, linked with Broughton, Stobo and Drumelzier and Tweedsmuir. Nine of those Ministers went into retirement from the charge. One of the jobs that Betty and Jessie will be giving up after many years is cleaning the church, it is no surprise to learn that as young girls they used to help their mother to do the same thing. Jessie can remember dusting in the pulpit and pretending to be The Minister and getting a telling off from her mother for her boldness. A harder task that fell on the girls was to head up to the church at six in the morning with pails of water to fill the tank for the heating and with matches to light the fire in the boiler. Latterly a young David Clarkson helped carry the pails of water. After their father died, when Jessie was just six years old, their mother had a job at Parkside in Broughton, the house that was on the site where the current manse now stands. It belonged to the Cameron family who owned and ran The Crook Inn at the time and apparently had a wonderful garden stretching right up the hill. This garden provided flowers for the church every week and Betty and Jessie used to collect them on a Friday afternoon when they got off the train from Peebles after school. During the school holidays they would take the bus over to collect the flowers: the regular double decker bus that ran from Peebles to Glasgow and could get you back from Biggar at 10pm during the week and 11pm on a Saturday. Betty and Jessie became elders in Skirling Kirk in 1976, around the same time as they took on the cleaning of the building, they served as Presbytery Elders for twenty-two years and Betty has acted as Treasurer for 18 years and Session Clerk for 17 years, an incredible record of service. They remember when there were frequently one hundred people in the congregation and regularly fifty to sixty worshippers. One thing they felt is an improvement nowadays is the friendly chatter before the service whereas everyone used to sit on their own in silence and the odd whisper would earn you a reprimand, and that was before the service started. Although Skirling Village looks much the same they have experienced many changes here too. There used to be two shops, a post office, a joiner and an electrician’s workshop as well as a school, and there would be something on in the village hall almost every night. Badminton twice a week, dances, whist drives, and the hall was always open as a newspaper was available in the Reading Room. At that time the Hall was the only building with a generator for electricity everyone else was still using paraffin lamps. There were also a couple of houses in the village that took in holiday makers who used to flood down from Glasgow during fair fortnight. and worship in Skirling Kirk. On Sunday 21st October there will be a joint service at Skirling followed by lunch in Skirling Village Hall so that we can thank Betty and Jessie property for their 'lifetime of service'. The first meeting of the Guild for this session will be on Wednesday 19th September in Broughton Village Hall starting at 2:30pm. Our speaker will be Rev Tony Foley who will be introducing the new 3 year Guild Strategy 'One Journey, many Roads' All are welcome to join us, new members and visitors are especially invited. The annual Harvest Supper will take place in Broughton Village Hall on Saturday 29th September at 6pm. This year, instead of asking for donations of baking, we would like donations of plums and apples BEFORE the day so we can transform them into crumbles. Please get them to Isobel (860274) or Fiona (830408). We can freeze them if necessary. UPDATE - We've had a huge response to this already so unless anyone has a suggestion as to what to do with excess apples and plums, we've got enough at the moment, thanks. The annual Harvest Supper will take place in Broughton Village Hall on Saturday 29th September at 6pm. This year, instead of asking for donations of baking, we would like donations of plums and apples BEFORE the day so we can transform them into crumbles. Please get them to Isobel (860274) or Fiona (830408) from today onwards We can freeze them if necessary. 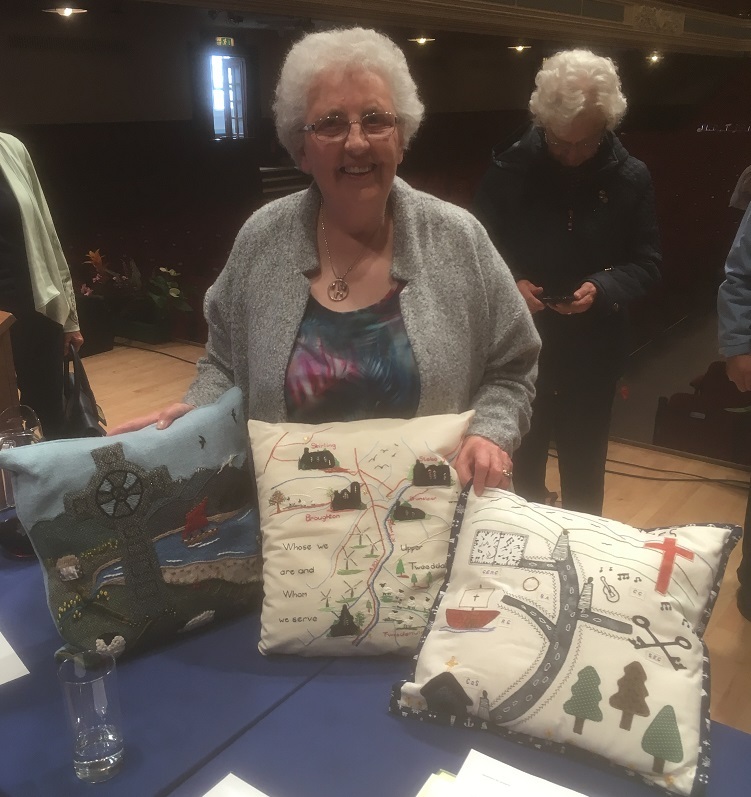 On 1st September Janet Hunter was in Dundee to attend the Guild Annual Gathering where it was announced that her embroidered cushion came second in this year's national Guild Convenor's Challenge. The challenge was to embroider a cushion.on the theme of "One Journey Many Roads", that being the Guild's theme for the next three years. The idea for the cushion design came from the free hand maps of the Parish that were produced when some members of our congregations undertook a Future Focus programme in 2016 and the initial design was drawn by Stella O'Brien, an elder in Biggar Kirk. On 26th August the visit of an inspiring group of young people from Malawi and Lebanon to the Presbytery came to a fitting end with a party/service at Innerleithen Church. The many activities (social and serious) of the visit were encapsulated in two hours of food and friendship. Fiona Burnett, convenor of the World Commission Committee of the Presbytery, conducted an interview with the group during which they gently laid down a challenge to us to listen more to young people, to embrace change so that the church can become more attractive to the young and to have more interactive services. Centrepiece for the event was Geoffrey Matias's graduation. By coming on the visit he had missed his graduation ceremony in Malawi so the Presbytery conducted its own ceremony, presenting Geoffrey (dressed in gown and mortar board) with a certificate and stethoscope. The ceremony was followed by a beautiful rendition of the Malawian National Anthem and through the evening the church was filled with some fine singing, both of the hymns sung by the congregation but especially by the young Malawian group whose extraordinary rhythm and harmonies brought smiles to everyone present. And of course thanks were given to everyone who had been involved in such a fantastic two weeks. Through their visits to churches, schools, the National Youth Assembly and Lindisfarne these seven young people had touched hundreds of people and the smooth running of the visit had depended on the enthusiastic involvement of hosts, volunteer drivers, multitudes of bakers and sandwich makers, Ministers and not least the co-ordinating prowess of the World Mission Committee itself. The pictures capture just some of the memories of the event. This evening, 26th August, there will be a farewell service and party for our visitors before they return home tomorrow. This will be held in Innerleithen church at 6pm and will be your last chance to meet and hear from our visitors. Everyone is invited to attend what should be a very colourful occasion. 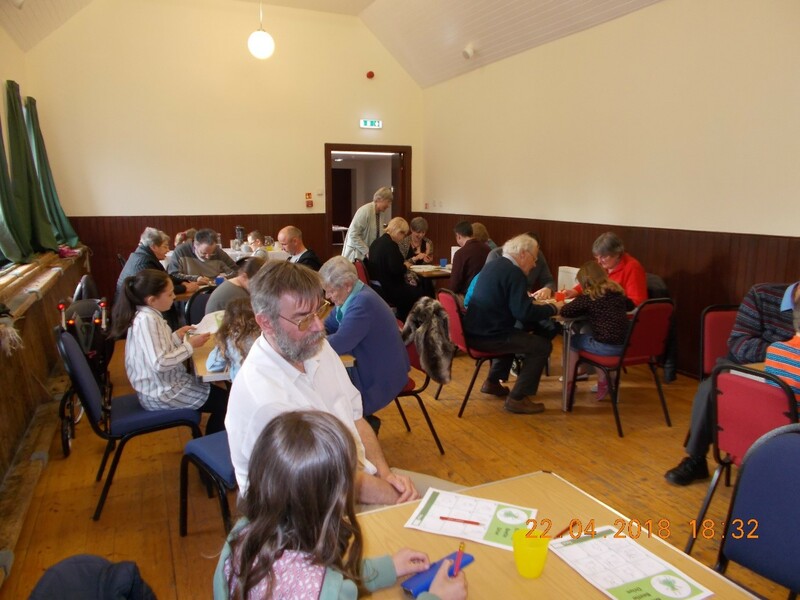 Next Saturday 1st September, the Presbytery is inviting representatives from each congregation to meet in Innerleithen Church Hall at 10am for a discussion on the future shape of our church in the Presbytery. This is in light of falling minister numbers and the need to plan for the future. If you would like to go as part of the group from Parishes of Upper Tweeddale, please let Isobel Hunter(860274) know. The first All age worship service of the new session will be on Sunday 2nd September at 4:30pm in Broughton Village Hall, followed by pizza and chat. Please put it in your diary and bring your friends and neighbours to join us for an informal service. It might be the middle of summer but we are already making plans for the autumn edition of Kirk Matters which is due out at the beginning of September. The deadline for articles to be sent to Isobel Hunter is Friday 17th August. 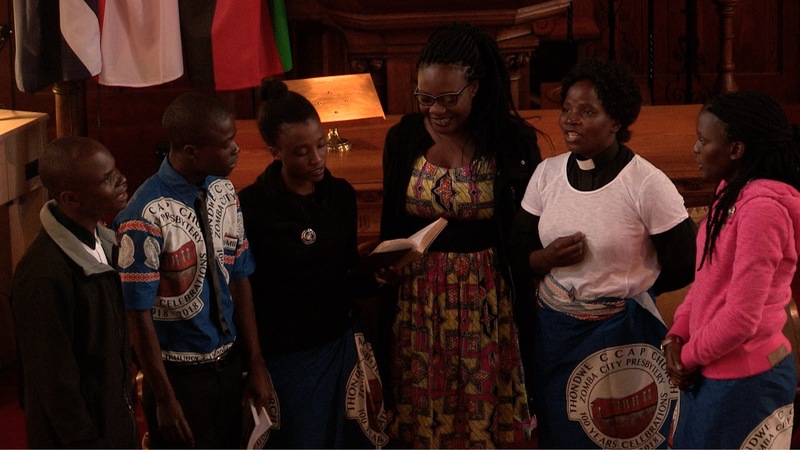 Our visitors from Malawi arrived on Friday for what is going to be a full programme in the Presbytery.Sadly the visitors from Lebanon had to pull out at the last moment due to illness with the other person unwilling to make the long journey by herself. We are still hopeful that they might join later in the visit. The first public event of the visit is a service of welcome followed by a fellowship supper in Earlston Church tonight (12th August) at 6pm. Everyone is welcome to come. If you would like or can offer transport, please contact Fiona (830408). Geoffrey Matias, one of the vistors and whom the Presbytery has funded through a Midwifery course, will be with us in Skirling church on Sunday 26th August for a joint service with Skirling and Broughton. His home church, Namadidi is partnered with Upper Tweeddale. After the service, there will be a simple soup and sandwich lunch served in Skirling Hall so you can meet Geoffrey and have a chat with him. Please note, there will be services in Tweedsmuir and Stobo that day but not in Broughton. On Sunday evening 26th August, there will be a farewell service and party for our visitors before they return home the next day. This will be held in Innerleithen church at 6pm and will be your last chance to meet and hear from our visitors. Everyone is invited to attend what should be a very colourful occasion. Our visitors from Malawi and Lebanon are due to arrive on Friday for what is going to be a full programme in the Presbytery The first public event of the visit is a service of welcome followed by a fellowship supper in Earlston Church on Sunday 12th August at 6pm. Everyone is welcome to come. If you would like or can offer transport, please contact Fiona (830408). Geoffrey Matias, one of the vistors and whom the Presbytery has funded through a Midwifery course, will be with us in Skirling church on Sunday 26th August for a joint service with Skirling and Broughton. His home church, Namadidi is partnered with Upper Tweeddale. After the service, there will be a simple soup and sandwich lunch served in Skirling Hall so you can meet Geoffrey and have a chat with him. Please not, there will be services in Tweedsmuir and Stobo that day but not in Broughton. On Sunday evening 26th August, there will be a farewell service and party for our visitors before they return home the next day. This will be held in Innerleithen church at 6pm and will be your last chance to meet and hear from our visitors. Everyone is invited to attend what should be a very colourful ooccasion. The Worship Workshop will meet tonight (29th July) in Skirling House at 7pm.Everyone is welcome to come along and join in the discussion and plans for worship in the Parishes of Upper Tweeddale in the forthcoming months. The planning for the visit of young adults from Lebanon and Malawi to Melrose and Peebles Presbytery is progressing well. The first public event of the visit is a service of welcome followed by a fellowship supper in Earlston Church on Sunday 12th August at 6pm. Everyone is welcome to come. If you would like or can offer transport, please contact Fiona (830408). Geoffrey Matias, one of the vistors and whom the \presbytery has funded through a Midwifery course, will be with us in Skirling church on Sunday 26th August. His home church, Namadidi is partnered with Upper Tweeddale and we hope to organise a lunch for him after the service so everyone can come and meet him. More details to follow. The Worship Workshop will meet next Sunday (29th July) in Skirling House at 7pm.Everyone is welcome to come along and join in the discussion and plans for worship in the Parishes of Upper Tweeddale in the forthcoming months. 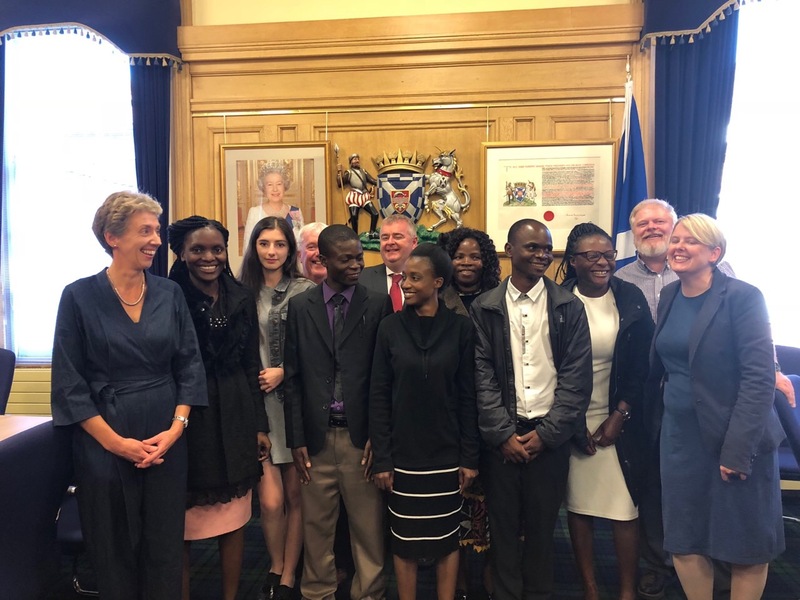 The planning for the visit of young adults from Lebanon and Malawi to Melrose and Peebles Presbytery in August took a step forward this week with the Malawians finally getting their visas, the Lebanese having got them a few weeks ago. The first public event of the visit is a service of welcome followed by a fellowship supper in Earlston Church on Sunday 12th August at 6pm. If you are thinking of going and would like transport, please contact Fiona (830408). Geoffrey Matias, one of the vistors and whom the \presbytery has funded through a Midwifery course, will be with us in Skirling church on Sunday 26th August. His home church, Namadidi is partnered with Upper Tweeddale and we hope to organise a lunch for him after the service so everyone can come and meet him. More details to follow. The holiday season is upon us so not so many events to announce. If, whilst on holiday you happen to visit another church, we'd be interested to hear about your experience and anything you think we should be considering doing in our parishes. The planning for the visit of young adults from Lebanon and Malawi to Melrose and Peebles Presbytery in August is well under way. If you would like to get involved by either hosting one of the visitors or volunteering as a driver during the visit (10th - 27th August) please contact Fiona on 830408. Also if you have a redundant, but in good condition smartphone that you would be willing to donate to one of our visitors, Fiona would be pleased to receive it. 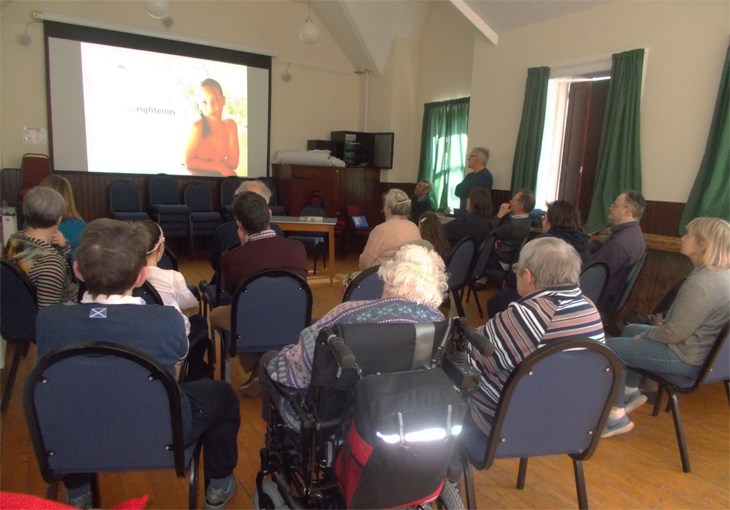 There was a large turnout for the Presbytery meeting on Tuesday, thank you to all who helped in the logistics and refreshments. Apart from ourselves who were given permission to call before the Presbytery Plan was suspended and Carlops, Kirkurd & Newland and West Linton who have had an Interiom minister appointed for 2 years, every other vacant charge in the Presbytery has had the vacancy process suspended until decisions are made about a future Presbytery Plan. This could take a year or so to get a plan agreed worrying a lot of people, we are all asked to pray for our sister congregations. Also if you have any ideas as to how you think the future shape of the Presbytery shoud be, speak to your Session Clerk who will forward on your ideas. 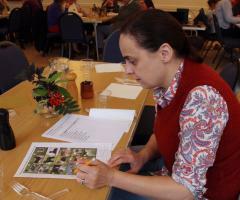 At the end of May at the service celebrating 50 years of women in ministry with the Church of Scotland the collection was given to Rev Rola Sleiman from the Presbytarian Church of Lebanon and Syria in Tripoli to use as she saw fit within her church. "Hope you are doing well. I will attach to you pictures of the games we bought from the money that was offered to me during the evening service. I bought one babyfoot and a football Goal. I wish you extend my greetings and thankfulness to the church members and everyone who was generous in giving and offering.May God bless them all. 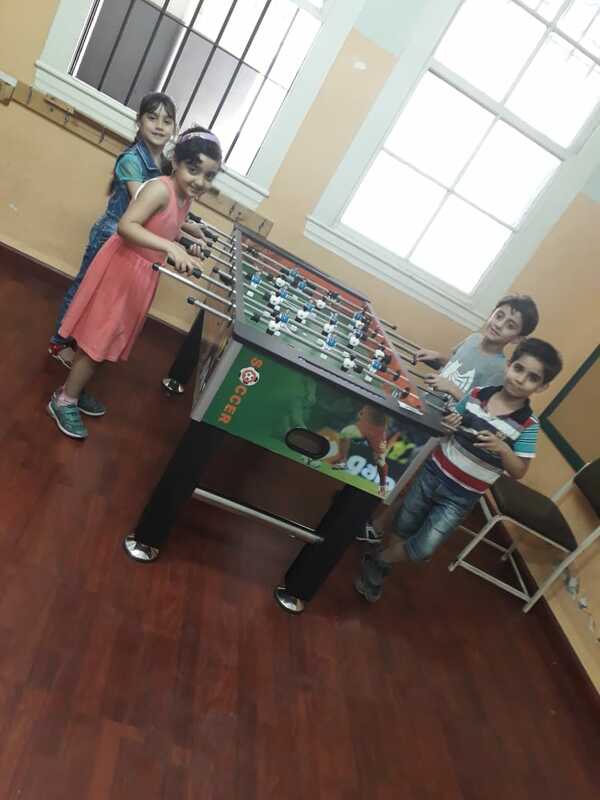 Kids were really excited and happy"
The pictures are surely evidence of what a difference having access to games and sports equipment makes to the young refuguees in northern Lebanon. Congratulations to Janet Hunter who has won 2nd prize in the Guild Convener's challenge this year. The challenge was to design a cushion along the theme of "One Journey, many roads" which is the Guild theme for the next 3 years. We took the idea of the maps that we produced for the future focus course we did a few years ago and Janet produced a map of the Upper Tweed area. There were 27 cushions that made it through to the national final and the first prize went to Lewis with Edinburgh third. The cushions will be on display at the Guild Annual Gathering in Dundee on 1st September and plans are afoot to make sure Janet can attend. Later in the year we'll send it round the churches for you to have a look at it. The planning for the visit of young adults from Lebanon and Malawi to Melrose and Peebles Presbytery in August is well under way. There is a meeting on Thursday 28th June from 6pm in Innerleithern church for anyone who would like to get involved in the visit. For more information contact Fiona on 830408. Please also pray for our Malawian visitors who are having their inverviews for visas on Monday. 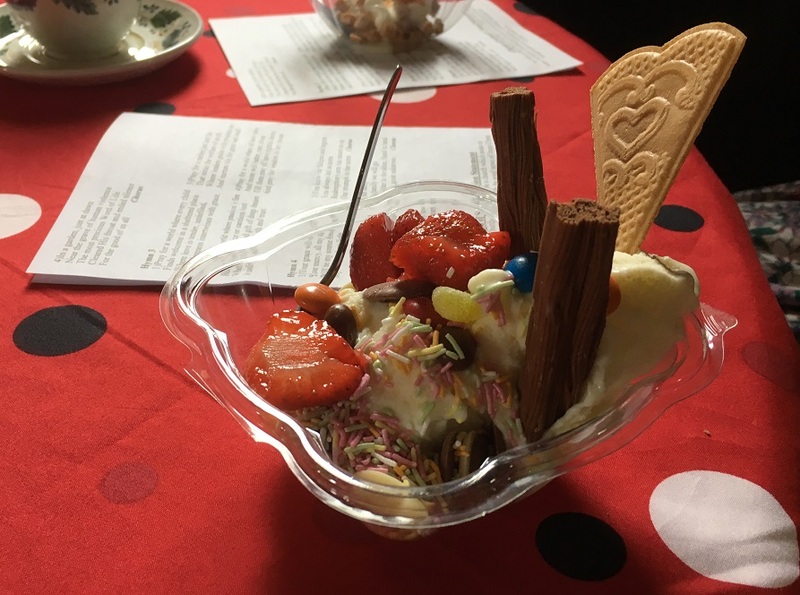 On Sunday 10th June about forty people from around the parishes gathered at Tweedsmuir Village Hall for a united Sundae Sunday service followed by ice cream and a wonderful range of sauces and toppings. The focus of the service was on the plight of displaced people, a theme often repeated in the Bible (the reading was the story of Ruth) and sadly far too relevant today. According to UNHCR the world "is witnessing the highest levels of displacement on record" with over 65 million people having been forced from their homes, over 22 million of whom are refugees, over half of whom are under 18 years old. 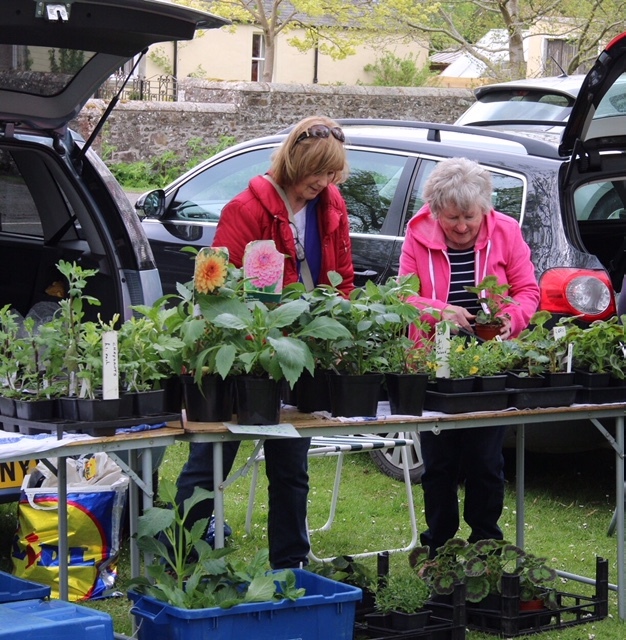 The service raised a further £305 to be added to the funds being sent to Christian Aid following Christian Aid Week and the Skirling Green car boot sale. 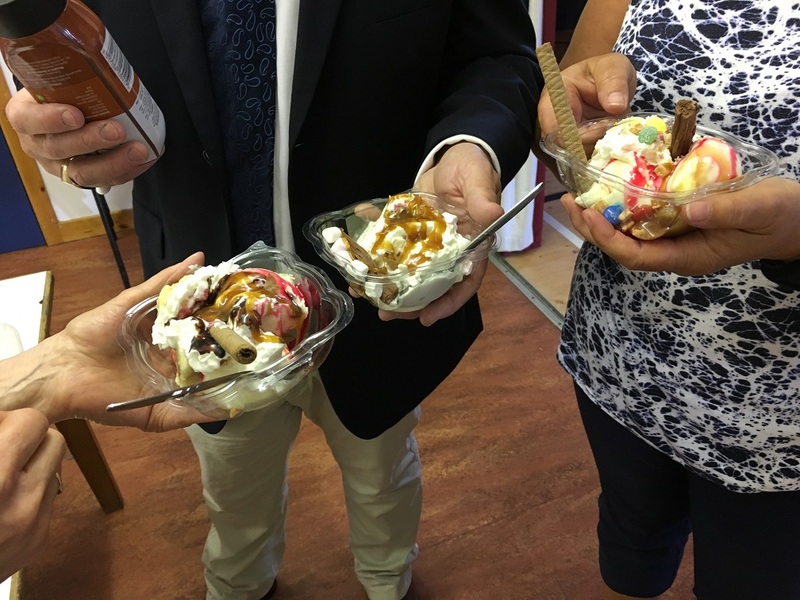 There were suggestions that ice cream should be a part of every service! 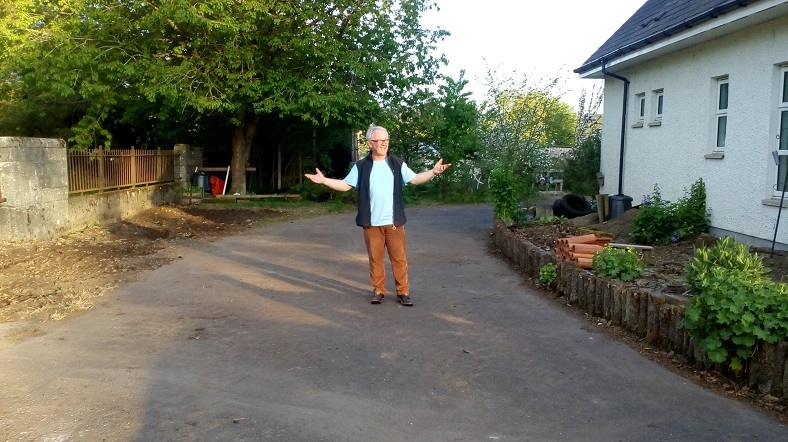 On Tuesday 5th June a very small team of very small people ably assisted by Finlay Smith, Lynn Smith and Christine Parker made the first steps towards erecting a brand new polytunnel for Broughton Primary School. The Parishes of Upper Tweeddale have funded the purchase of this tunnel through last year's Harvest Supper and collections during Christmas services and other events. This work cleared the ground ready for the polytunnel's installation. The polytunnel will make it possible to teach children at the school about horticulture and plant biology in a practical way. 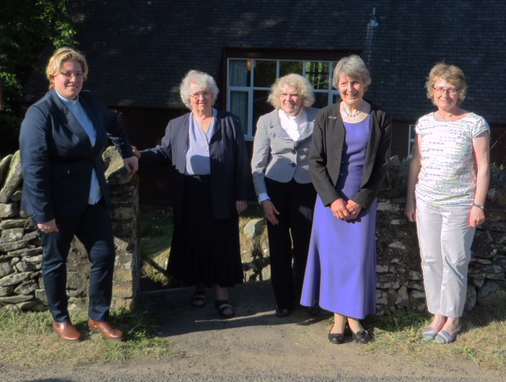 To celebrate the 50 year anniversary of the ordination of women as Ministers in the Church of Scotland Sunday 27th May saw a special and inspiring service in Drumelzier Church. The service was lead by the Very Rev Dr Sheilagh Kestings, one of just four women to have held the post of Moderator of the General Assembly. She is also connected with Drumelzier Church in that her grand-father was a previous Minister of Drumelzier. Dr Kesting had chosen four hymns written by Kathy Galloway, Bernadette Farrell, Shirley Erena Murray and June Boyce-Tillman. The singing was loud and beautiful bolstered by a congregation approaching fifty strong. 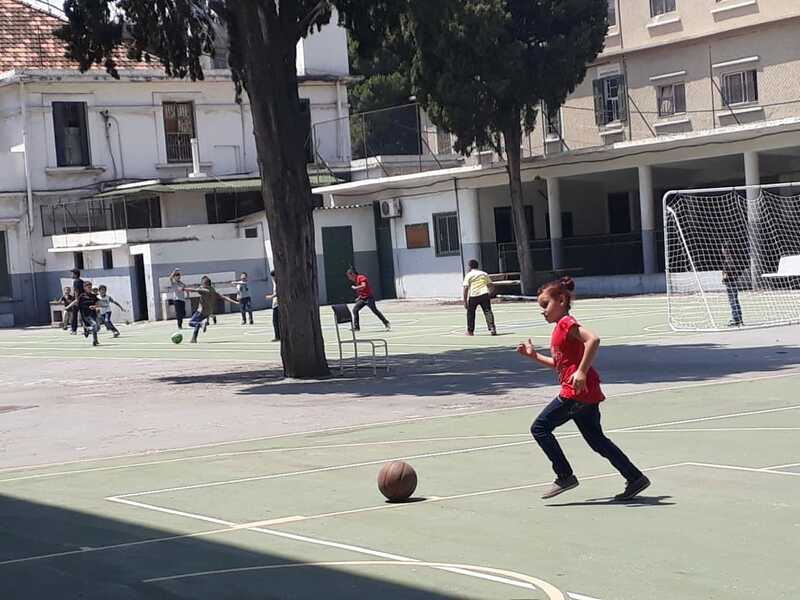 A retiring collection raised a fantastic £270 which has gone to Rev Sleiman's church in Tripoli where they are doing amazing work to help and support the Syrian refugee community in their area. 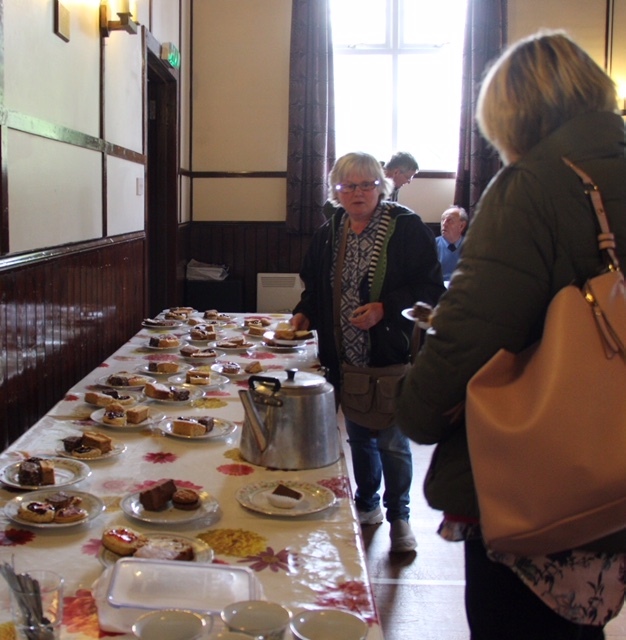 Many thanks go to Ros Kerr and Jane Gillham who were responsible for the tea and cakes in Drumelzier Village Hall after the service, and to Julian Birchall for making it all happen. 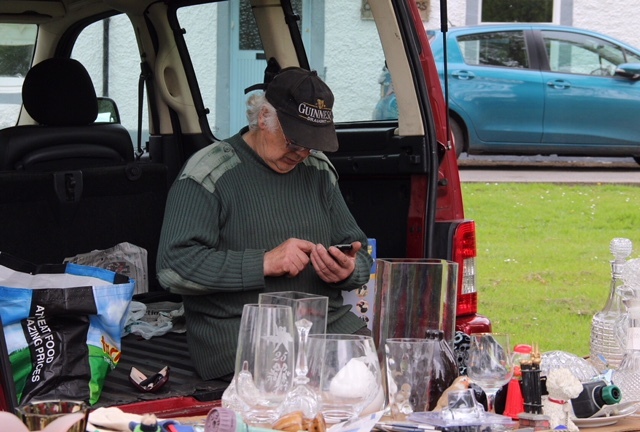 After a week of beautiful sunny weather, the clouds rolled across on Sunday but the rain stayed away and the change in the weather didn't deter the many visitors to the Skirling Green Car Boot Sale to raise money for Christian Aid. There were more than 30 car boots surrounding the green and the tea room served nearly 170 teas. Many thanks go to the many willing volunteers who gave up their afternoon to help and to the many people who contributed to the amazing spread of refreshments served in Skirling Village Hall. So much was raised that the money is still being counted but the figure will be published here when we have it to hand. 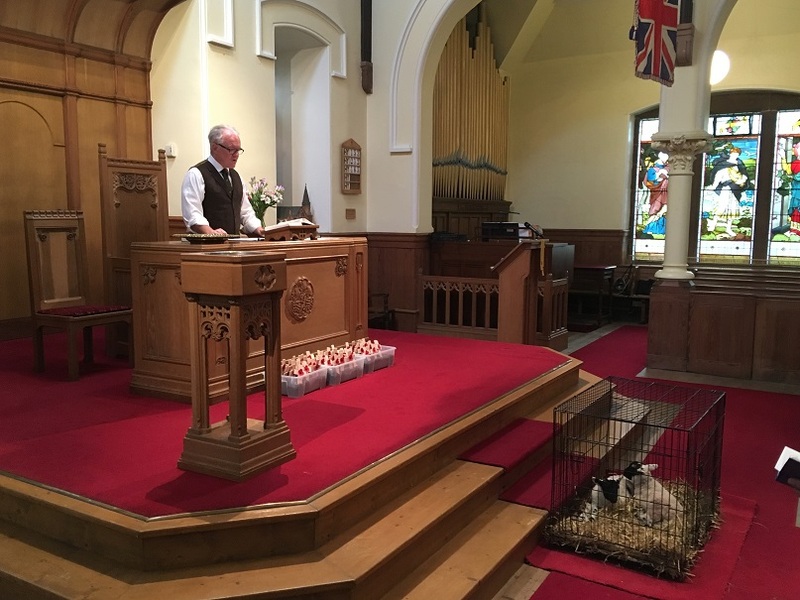 The annual lambing service was held on Sunday 13th May at Broughton Kirk. 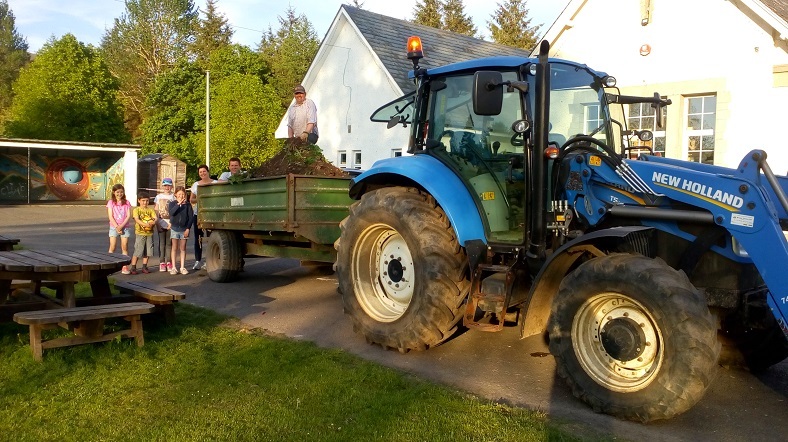 Tony Foley lead the service highlighting the difficulties that farmers in Upper Tweeddale have been facing this year with the particularly severe late Winter weather. And he emphasized our appreciation for the amazing hard work that our farmers and shepherds put in with so little reward, and also the blessings that we all share of living and working in such a beautiful part of the world. 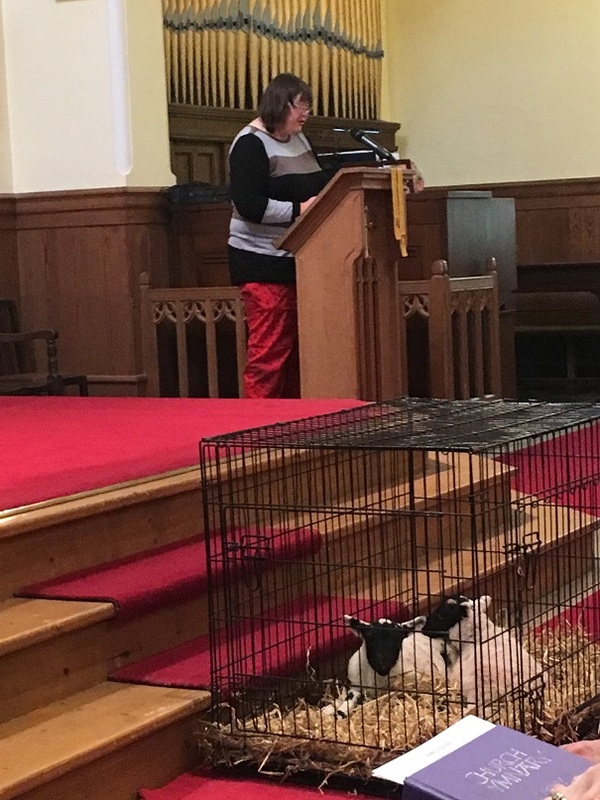 Two lambs kindly brought along by Lynn and Finlay Smith added their voices to the singing and the prayers but appeared to fall asleep during (and despite) Tony's thoughtful and entertaining sermon! The service was well attended with people coming from as far as Peebles and even one from New Zealand! 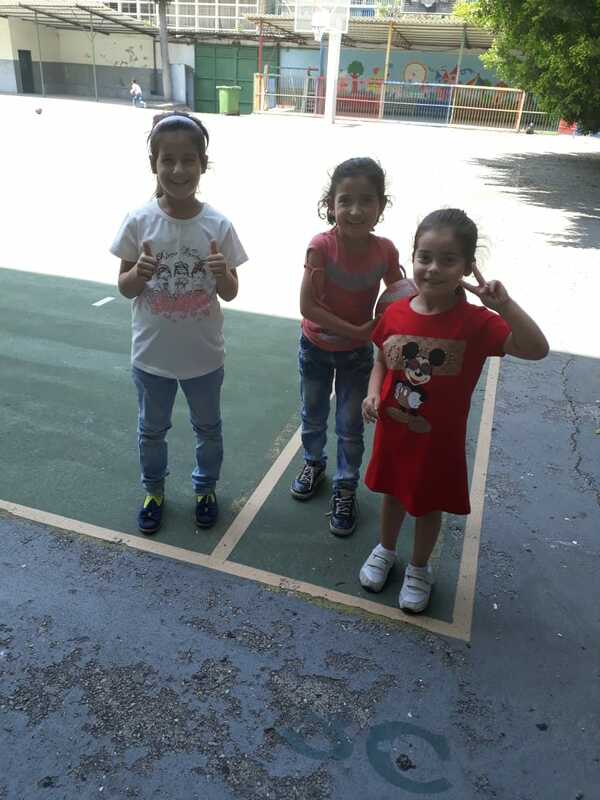 Together they contributed £150 to go to the Royal Agricultural Benevolent Institution (RABI). 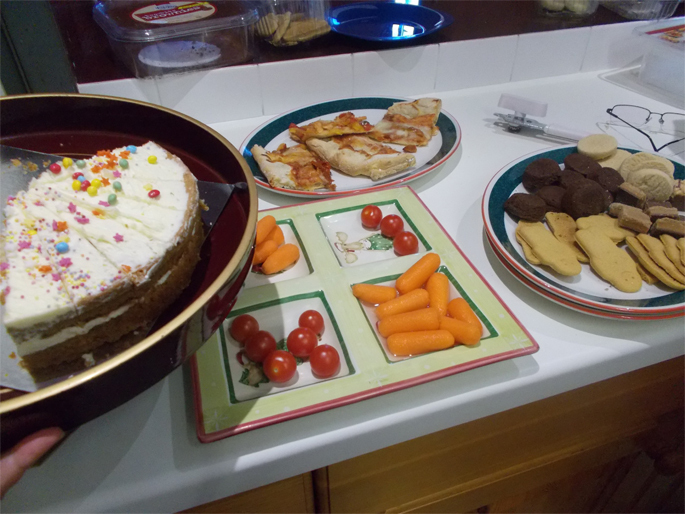 After the service they all tucked into rereshments and some scrumptious cake provided by Ros Kerr. Thanks go to everyone who came along to participate in such a special event in our calendar and who supported such a worthy cause. The cushion in Tweedsmuir Kirk's has recently been re-upholstered and is now back in place in the pulpit awaiting the installation of a new Minister. 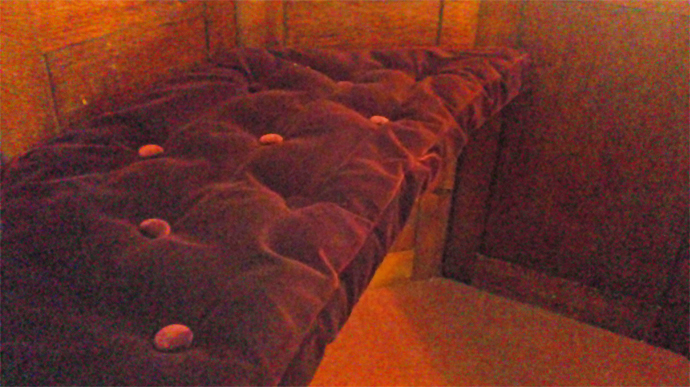 The cushion used to be very threadbare, was lumpy and torn with horse hair protruding. Maura Glatt, a member of the congregation, took on the challenge and skilfully reupholstered the cushion in it's new plush cover, chosen to match the pulpit surround. 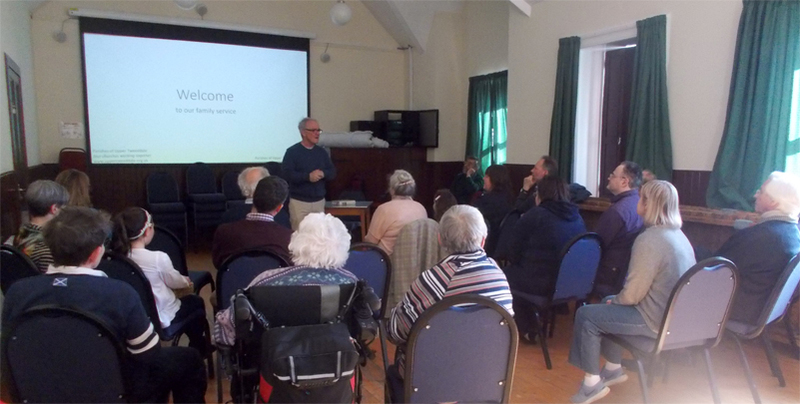 On Sunday 29th April we held the first of a series of monthly 'family' services in Broughton village's 'small hall'. 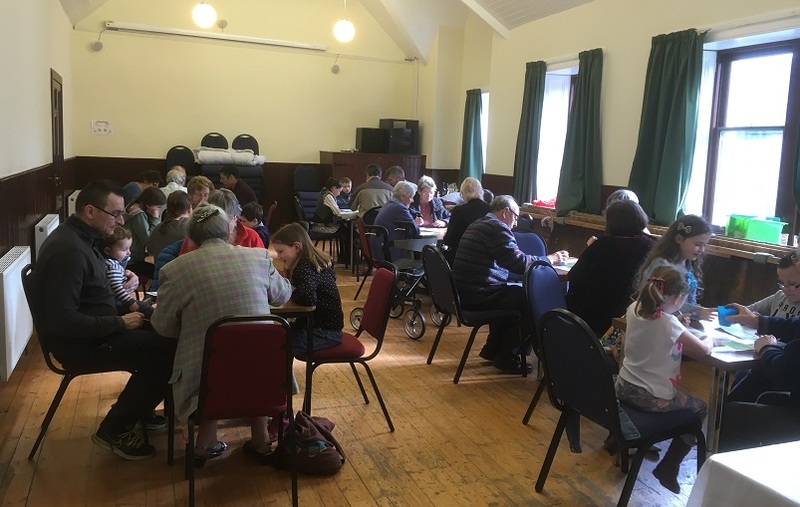 These gatherings are designed for people of all ages and aim to contain something a little different from the regular Sunday morning services held in the four churches of Upper Tweeddale. This one had a lively mix of modern music accompanied by videos projected onto the big screen, Bible based stories and prayer followed by a pizza supper. Fiona told the story of the Hidden Treasure in her own words, Peter read the story of the Good Samaritan from the Bible with projected words and pictures, and Tony lead a short discussion about the meaning behind the Good Samaritan, everyone having the opportinity to to get involved. Pizza and salad and a variety of cakes were served immediately after the service. The next one is scheduled for Sunday 3rd June at 4:30. Whatever your background, wherever you are visiting from and regardless of whether you attend or have ever attended church in the past you will be made very welcome. A whole host of weird and wonderful beetles appeared in Broughton village hall on Sunday evening (22nd April) where the young and young at heart gathered for a beetle drive in aid of the Guild's projects and activities. 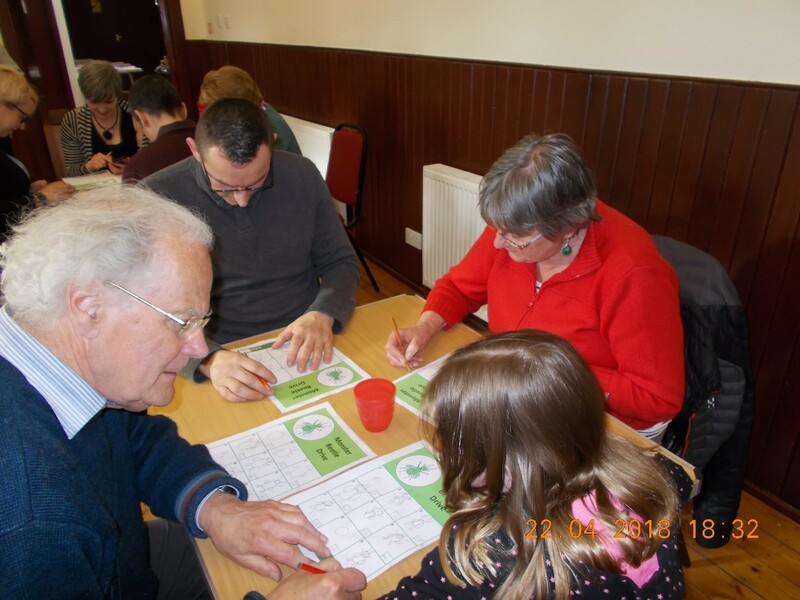 Some of those playing revealed a previously hidden talent for drawing beetles, others discovered an uncanny knack for throwing the right number on the dice at the right time, while the rest of us simply had great fun and tucked into the pizza and cakes. Prizes were awarded to four talented artists for the best drawn beetles (not an easy one to judge!) while Mary Smith walked away with the prize for winning the competition as a whole amid much muttering about the laws of probability and weighted dice! There was a well supported raffle too and the whole thing raised over £150. Many thanks to all who came along and helped to make the evening such a success.